Stations mazes are great because they get students up and moving around the room. 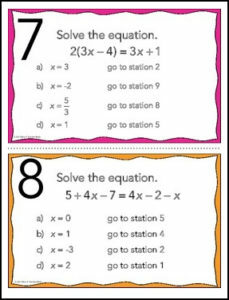 They also encourage students to check their work carefully since an incorrect answer will eventually send them back to a problem they have already solved. Successfully completing the maze requires students to slow down and check their work. This activity can be completed individually or in pairs. A student answer sheet is included. All of the stations are in color. There are 10 stations. All of the problems are solving multi step equations. Some of the problems involving parentheses involve distributing. The problems are of various difficulty. If you have any questions or comments please email me at: mrseteachesmath@gmail.com.